As the saying goes ‘From tiny acorns mighty oak trees grow‘. 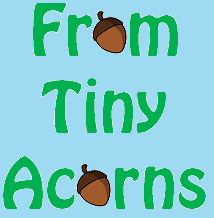 From Tiny Acorns was established in 2009 with the mission to nurture and inspire young minds with a passion for learning. Every child is born with tremendous potential and hidden talents waiting to be discovered and nurtured. We recognize the importance of early childhood education that offers limitless opportunities in stimulating the young minds and inculcating a positive learning attitude. Our programmes for toddlers and preschoolers are planned based on the principles of inter-disciplinary thematic teaching method. Every lesson is delivered with a coaching style that encourages the development of strong language foundation, inquisitiveness and problem-solving skills. Early and consistent exposure to our method of learning shall provide your child with a headstart advantage academically, and more importantly, opening up a world of possibilities for your child as he becomes a confident and independent individual with a strong love for learning.